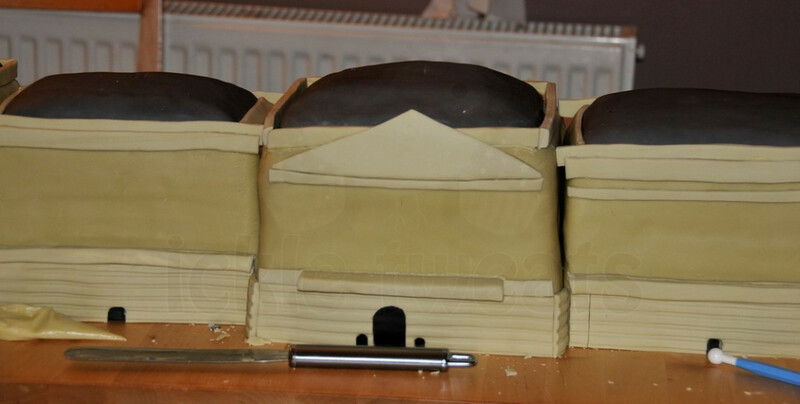 This picture really shows the size! 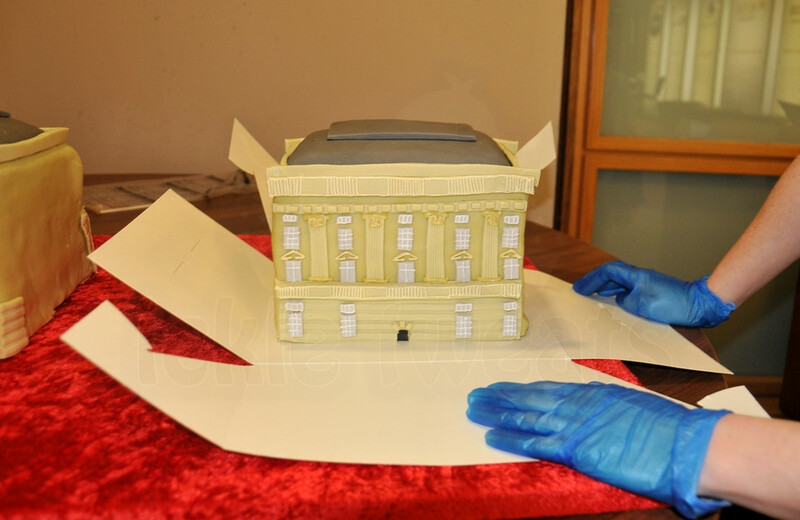 The cake measured approximately 40″ wide. 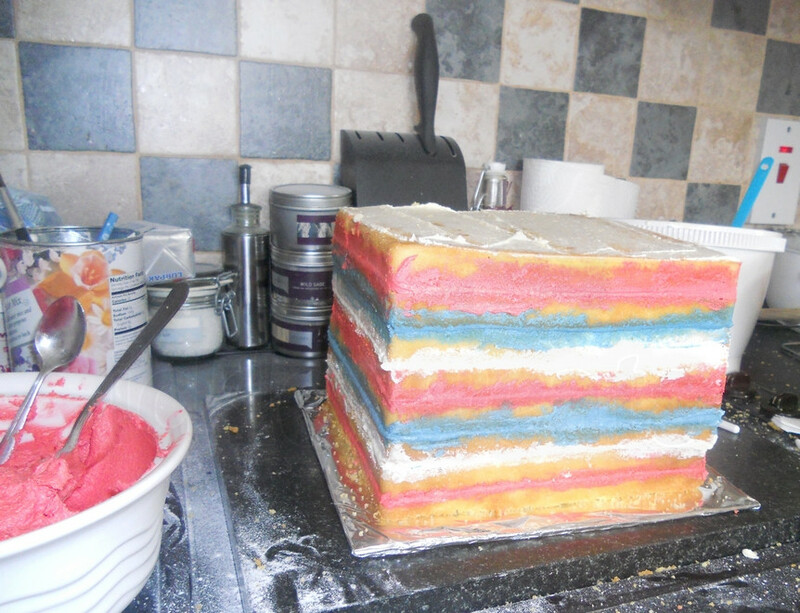 Enquiries for all types of theme cakes come to Ickletweats so nothing really phases me anymore, yet when this enquiry came through I must say I did take a deep breath. 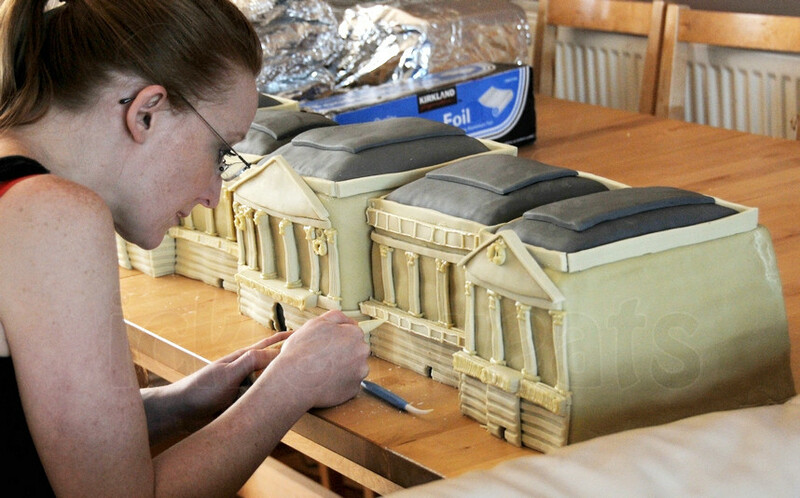 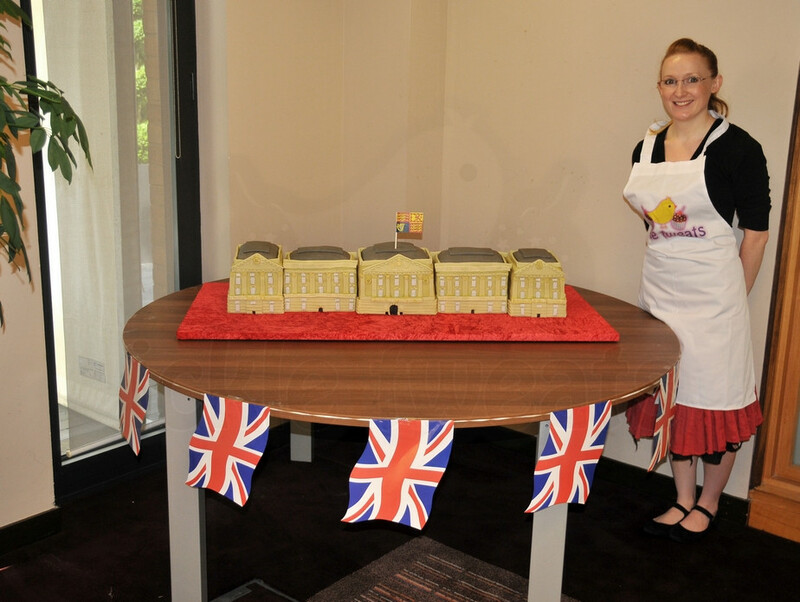 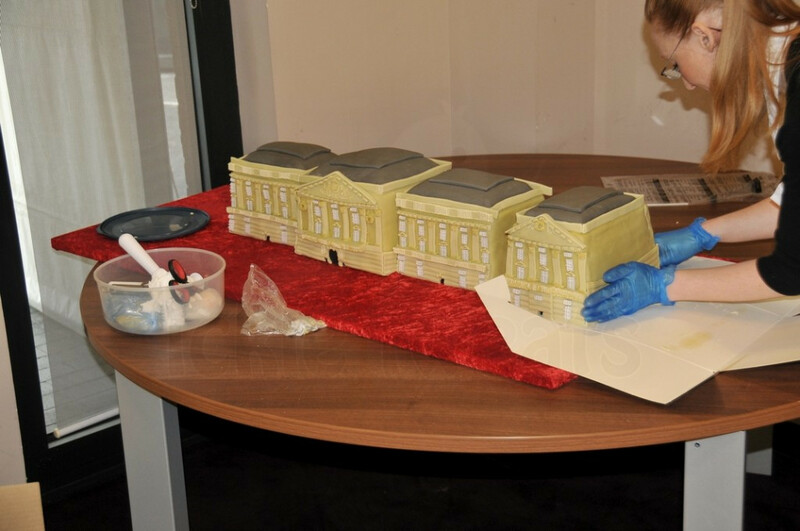 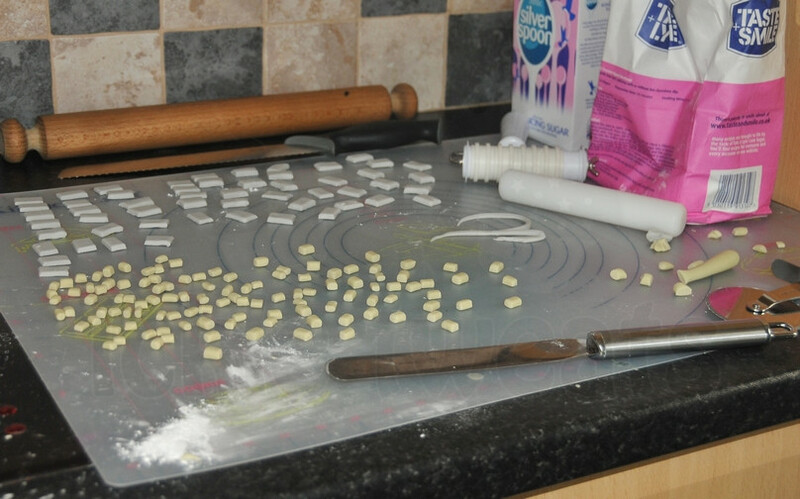 The brief sounded simple enough, make a cake for 500 people for a Diamond Jubilee party. 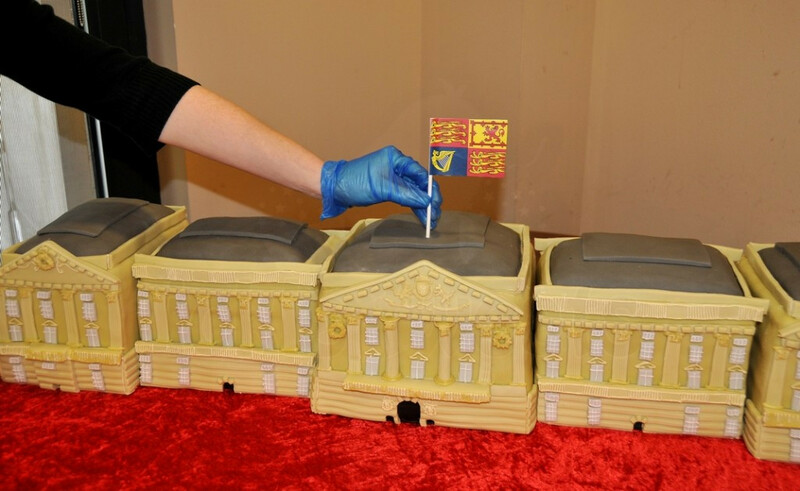 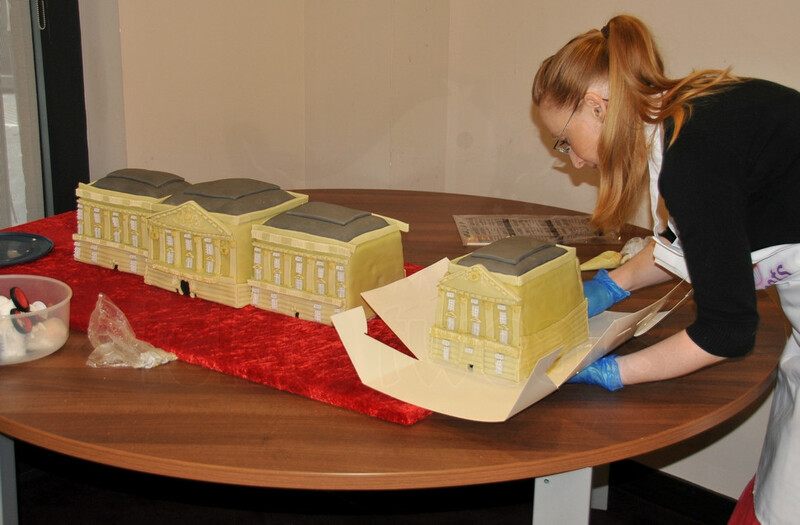 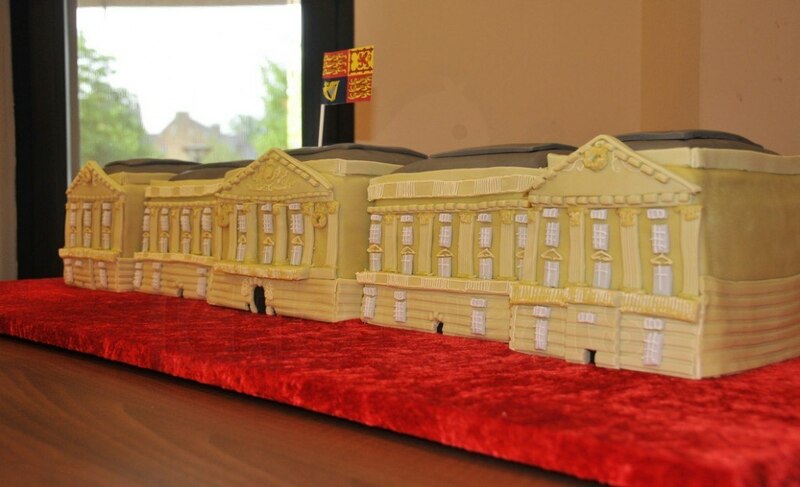 Only thing is it has to be a facsimile of Buckingham Palace and we really don’t want any compromises. 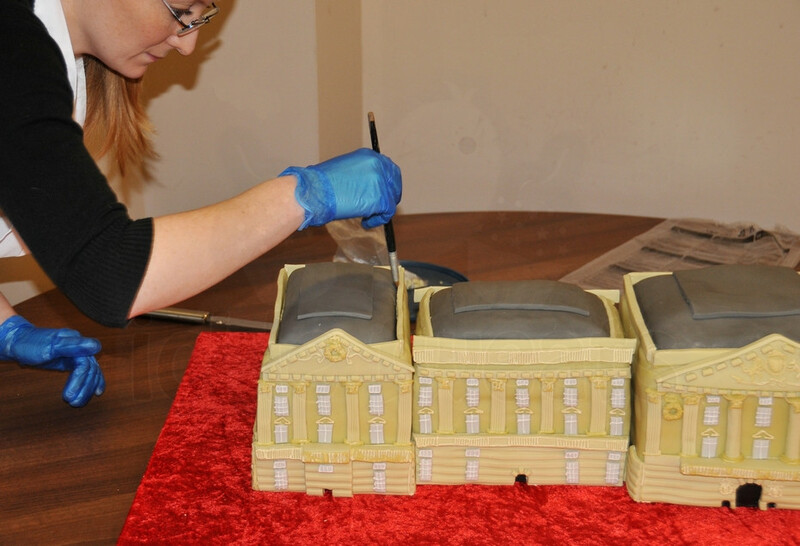 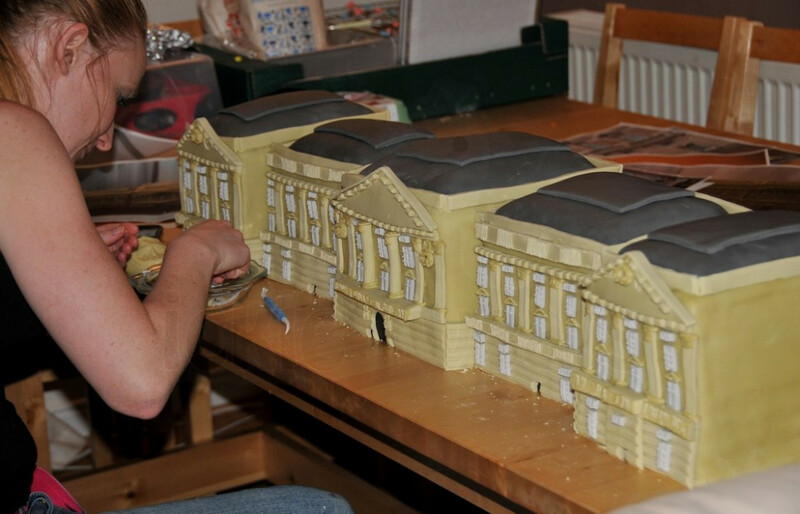 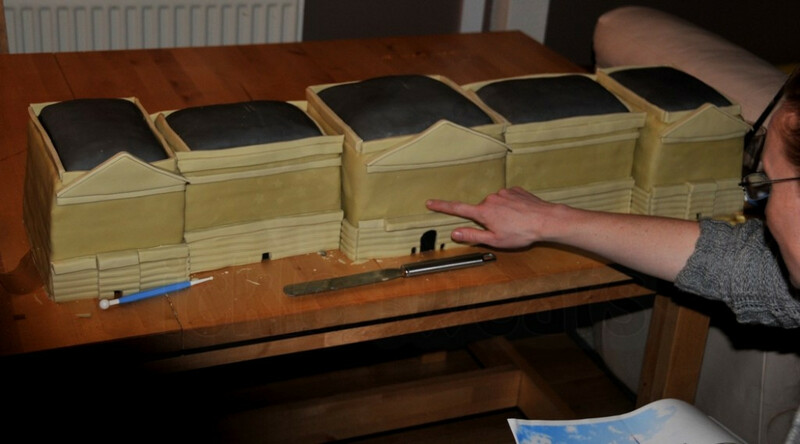 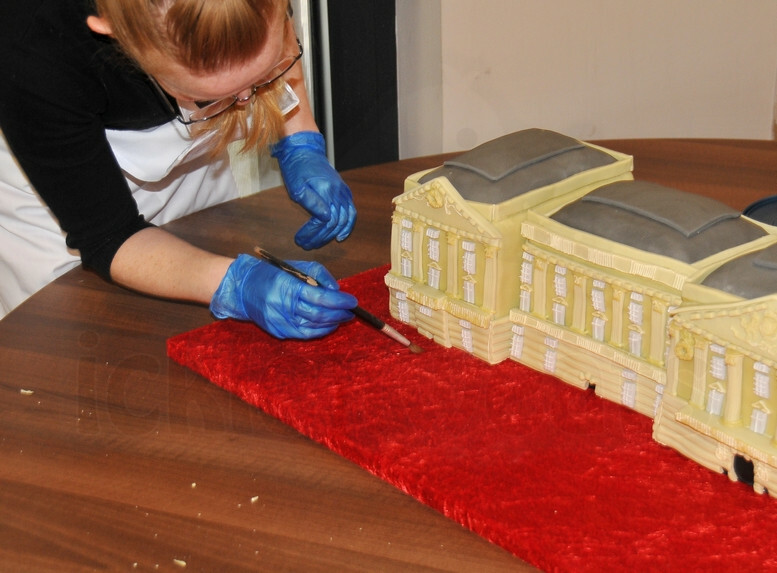 The cake was destined for a well known hotel chain who were used to having only the best. 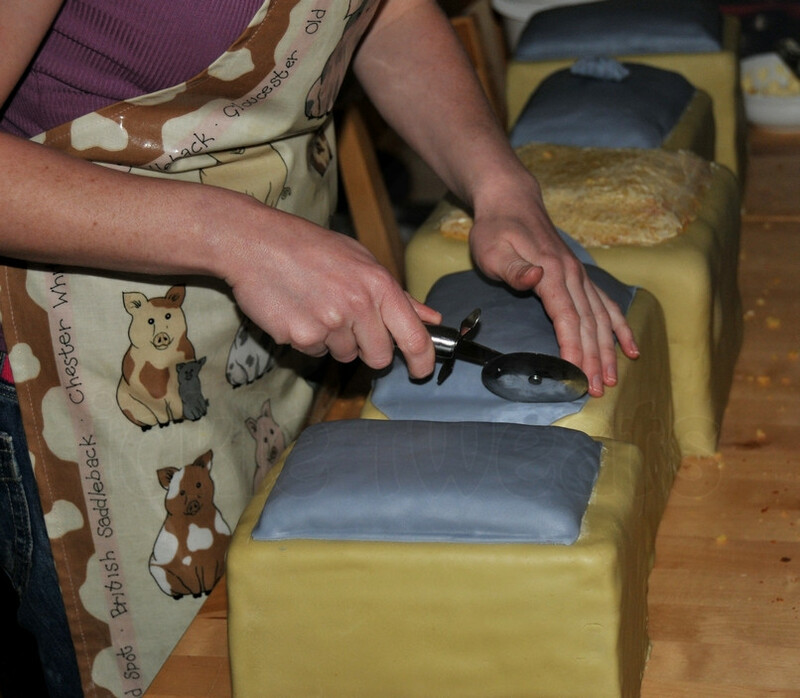 No pressure then! 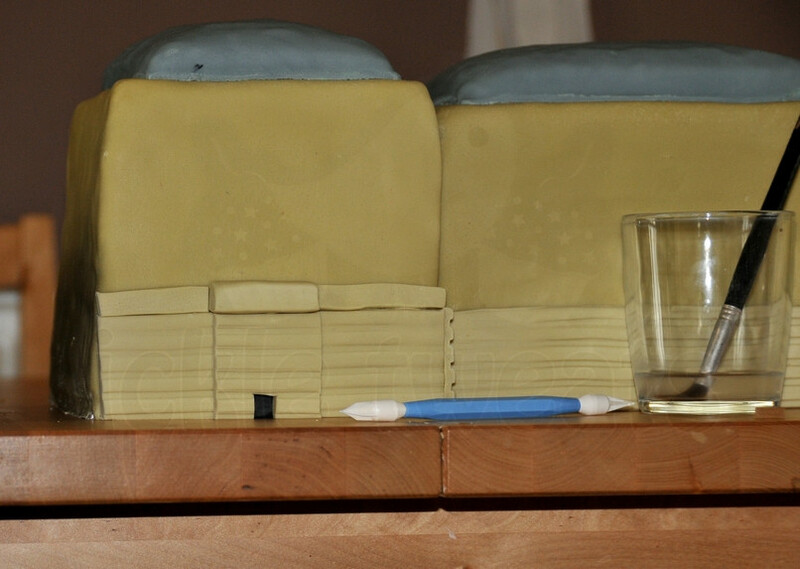 So the planning began. 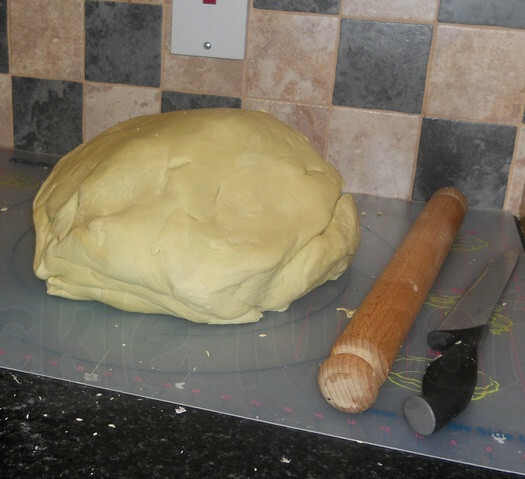 The shopping list was huge, trust me you get some funny looks when you enter a shop and ask for 120 eggs, 7kg of butter, 6kg flour, 3kg icing sugar and so on. 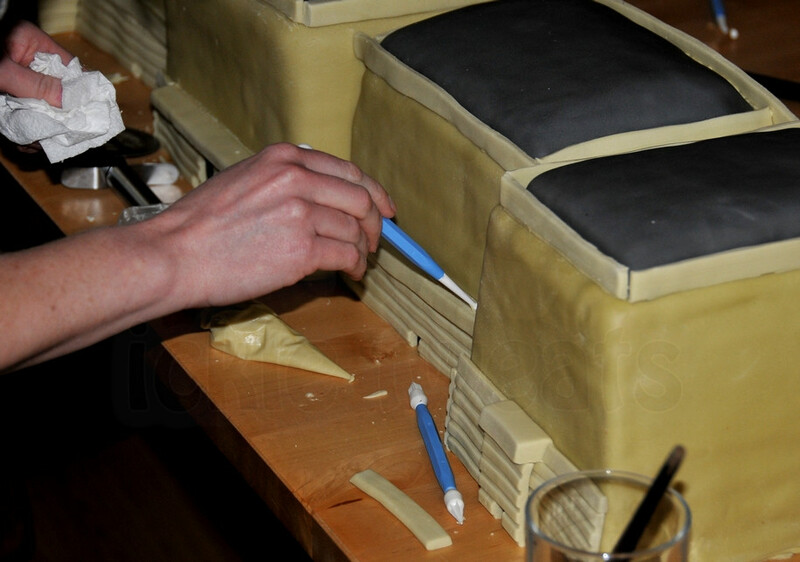 One of the issues with a cake this size would be transportation so I decided to make it in five separate pieces. 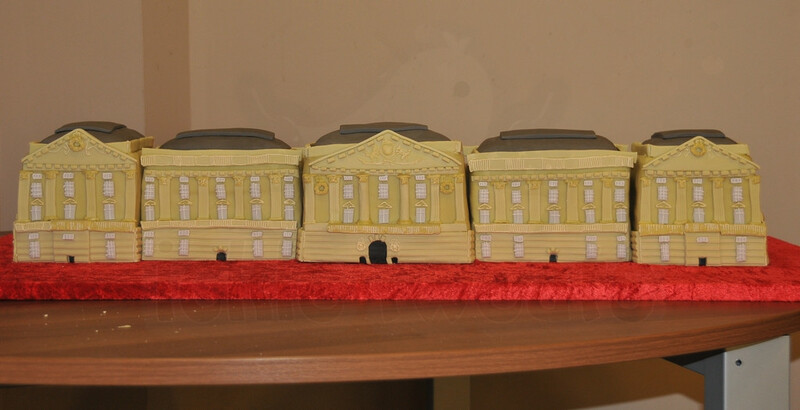 That would also help me in sizing the various aspects of the palace and make it a little easier to make. 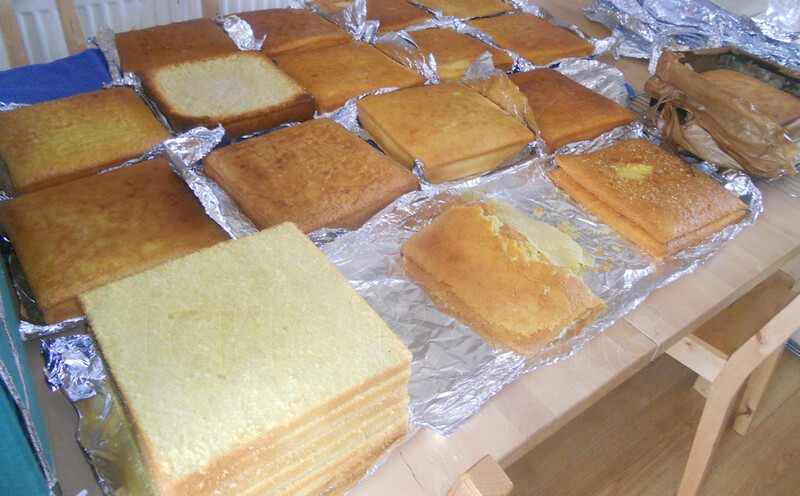 After quite a bit of research on the net I had all the pictures I needed to begin work. 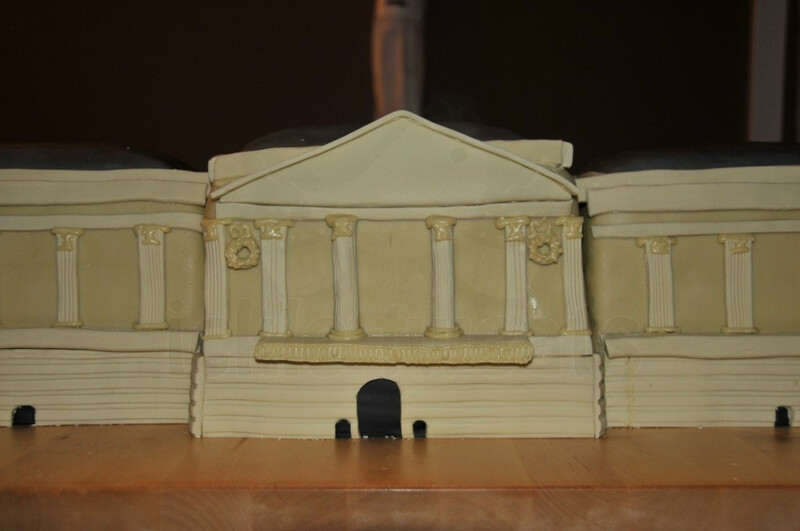 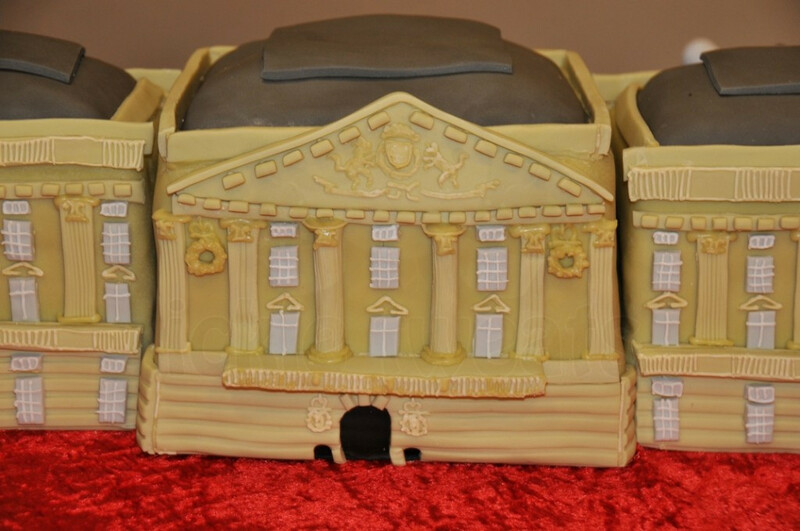 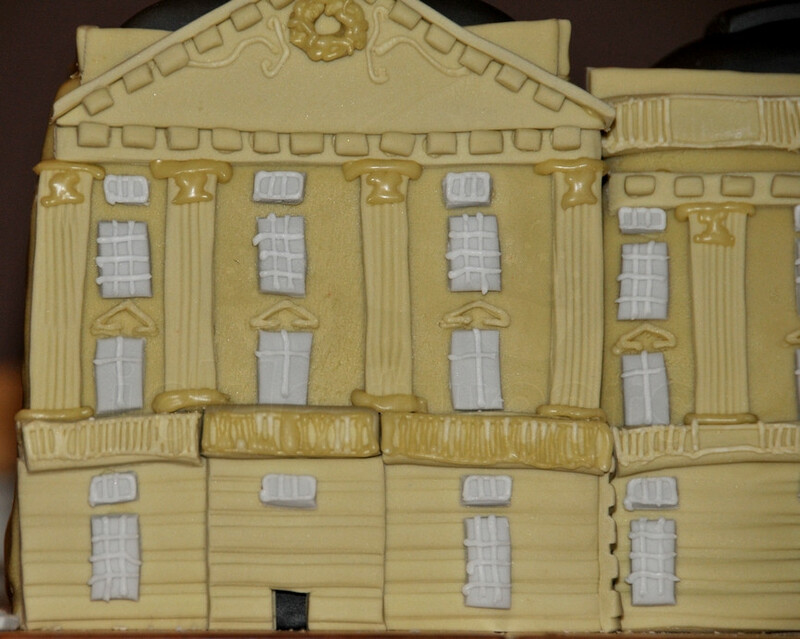 Lastl I had decided that the cake should be a characterture of Buckingham Palace and I had a particular idea how it should look, I think it turned out pretty well you be the judge. 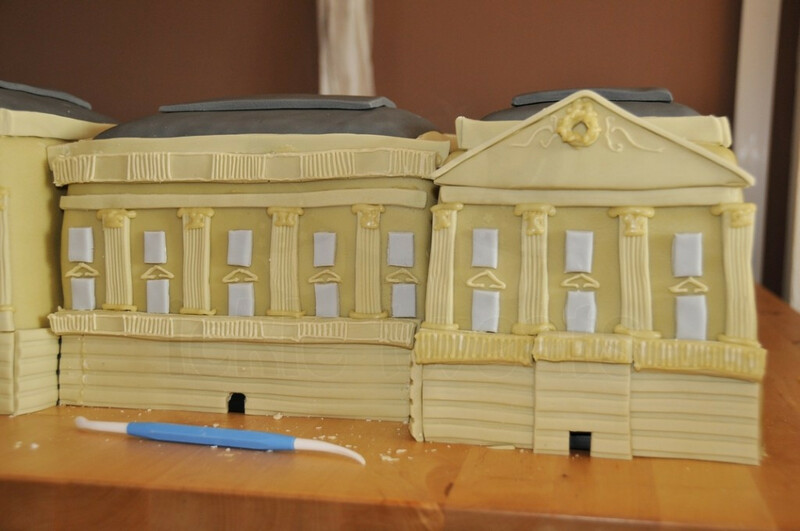 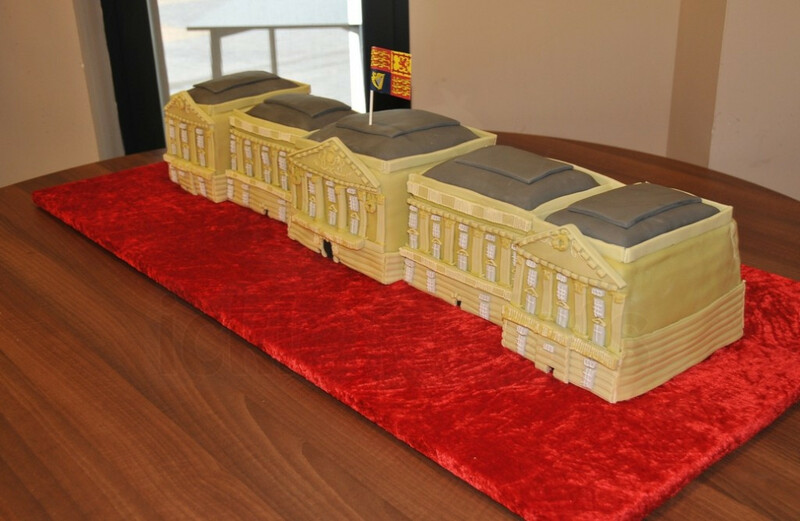 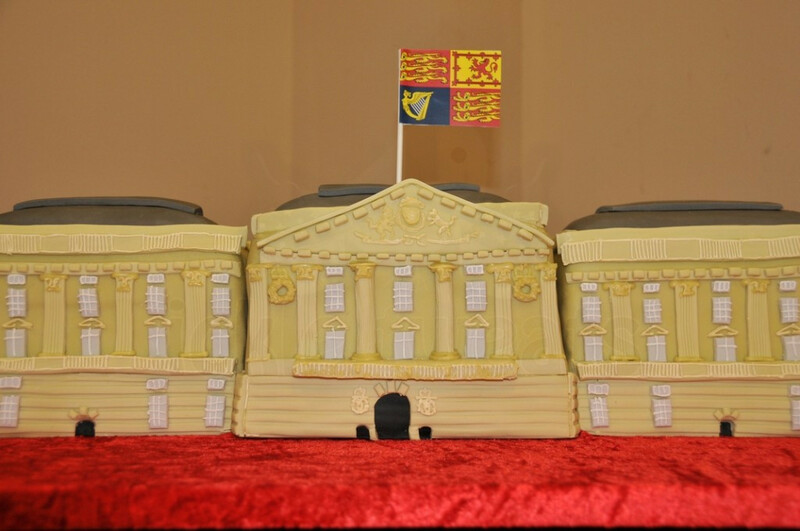 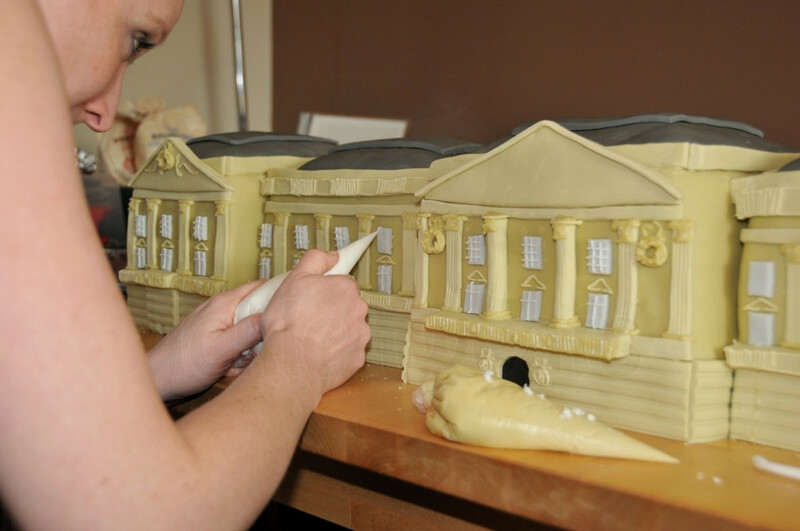 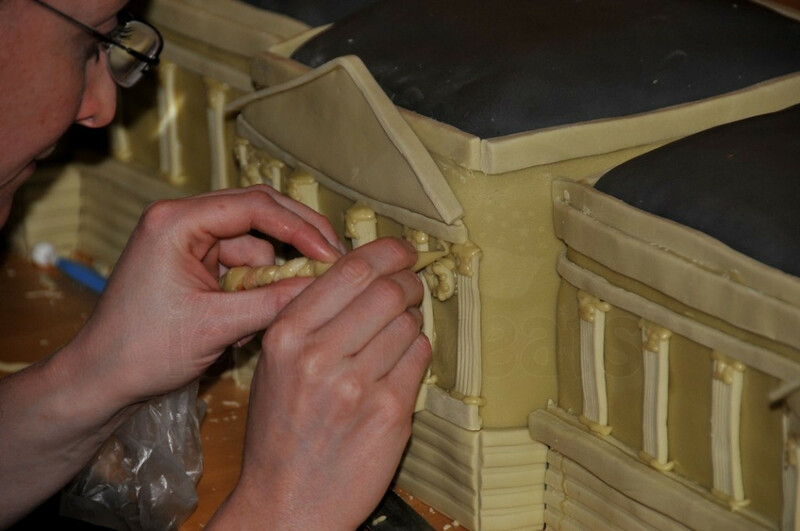 The cake began with a lot of mixing and baking but finally by about day 3 it began to resemble Buckingham palace in all its glory. 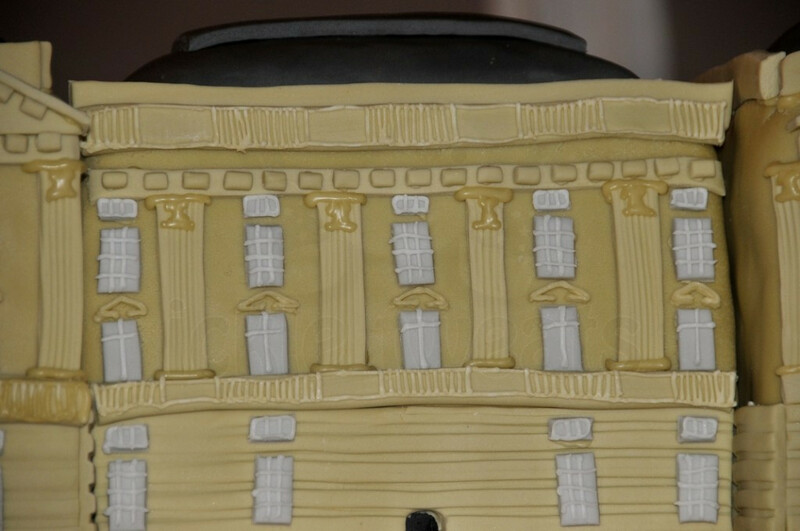 The attention to detail like piping the windows and the Royal Crests took some time to get right or at least as close as I was satisfied with! 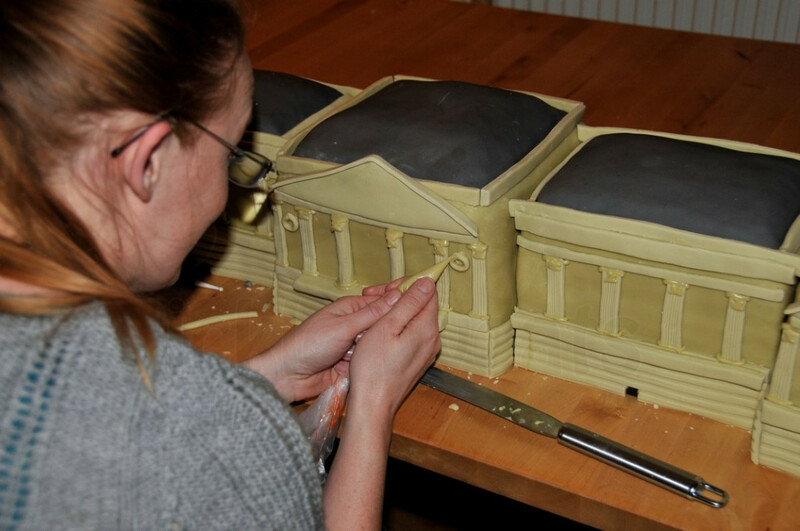 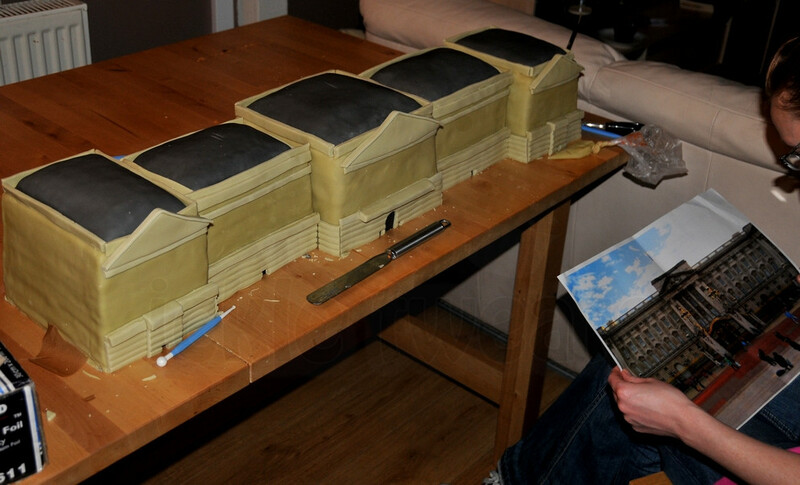 As corporate cakes go this was about the largest to date, it was a pity to eventually have to cut into it!